David was born and raised in London, showing an early interest in painting, drawing and natural history. After studying science with biology A level he changed direction and spent a year at Harrow College of Art, before taking a Fine Art degree course at Trent Polytechnic. Whilst he was at Trent, David became involved with experiments in conceptual and performance art, but later came to question the assumptions of modernism. His rejection of modernism was, however, not so much a return to the beginning, as a rite of passage which has brought aspects of abstraction to his current landscape and figurative paintings. David has lived in West Wales since 1976, and the landscape of this part of Britain forms the subject of many of his paintings. 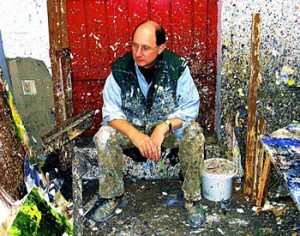 He has exhibited in Wales, England, Ireland, France, Holland and America, and has works in public collections including The National Museum of Wales, MOMA Wales, The Guildhall Art Gallery – City of London and Chichester’s Pallant House Gallery. You can view details for David’s 2018 course here.